Age discrimination occurs when a person is treated less favourably, or not given the same opportunities as others in a similar situation, because he or she is considered to be too old or too young. The Age Discrimination Act 2004 (ADA) prohibits discrimination in employment on the basis of age. It applies to young and older workers alike. The ADA also protects younger and older Australians from discrimination in other areas of public life, including education; getting or using services; or renting or buying a house or unit. In addition, the ADA makes it unlawful to harass or bully another person because of his or her age. The ADA makes it unlawful to discriminate on the basis of age when advertising jobs; during recruitment and selection processes; when making decisions about training, transfer and promotion opportunities; and in the terms, conditions and termination of employment. Stereotypes about young people and mature workers can greatly influence decisions made during recruitment and in the workplace. harassing or bullying a person because of his or her age. 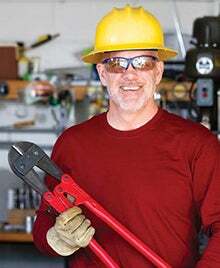 All types of employers and employment relationships are covered under the ADA, including: Commonwealth Government employees, state government employees and private sector employees; full-time, part-time and casual employees; contract workers and commission agents; as well as apprentices, trainees and those on probation. It also covers recruitment processes organised through recruitment and employment agencies. The ADA makes it unlawful to discriminate against people on the basis of age in the provision of goods and services, such as banking and insurance services; services provided by government departments; transport or telecommunication services; professional services, such as those provided by lawyers, doctors or tradespeople; and services provided by restaurants, shops or entertainment venues. because of his or her age. For example, it would be discriminatory for a real estate agent to refuse to rent a house to two 19-year-old university students because ‘they might damage the property by partying too hard’. Direct age discrimination happens when a person is treated less favourably because of his or her age than a person of another age would be treated in the same or similar circumstances. For example, it could be direct age discrimination if a person is selected for redundancy simply because of his or her age. For example, it could be indirect discrimination if an employer requires an older person to meet a physical fitness test, which more young people are able to meet, if that fitness standard is not necessary for the job in question. Like other anti-discrimination laws the ADA says that, in some circumstances, treating someone differently because of his or her age in employment or in the provision of services is not against the law. This is known as an exception. For example, as a person must be over 18 years old to work in a bar, it would not be discrimination if a bar owner refused to employ a person because he or she was under 18 years. Under the ADA, it is not unlawful for an organisation to advertise for, employ and pay a person as a junior up to the age of 21. It is against the law, however, to dismiss a person from employment because they turn 21. In addition, voluntary work and domestic duties in private households are not covered under the law. The ADA also says that it is not against the law to provide a genuine benefit to people of a particular age group or to do something that helps meet an identified need for people of a certain age group. For example, ‘positive discrimination’ may include discounts and concessions provided to older Australians using a Seniors Card and special accommodation assistance provided to homeless teenagers. It is not against the law to refuse someone a job if, because of their age, he or she can’t perform the ‘inherent requirements’ of the position. In other words, a person must be able to carry out the essential duties of the job. For example, a young person may not be able to meet the inherent requirements of a courier job if they are not yet eligible for a driver’s licence. A 60-year-old woman who had been employed as a casual for two years with a club was made redundant. She alleged she was made redundant because of her age and claimed a younger person was later employed in her position. The club said that her employment had been terminated for operational reasons. The complaint was resolved through conciliation with the club agreeing to reinstate her to her former position, pay financial compensation and provide her with a letter of apology. Two people under 25 years of age were each required to pay a $20 bond to stay at a caravan park. The manager of the caravan park confirmed that people under 25 years were required to pay a cash bond and said that this policy was introduced to discourage anti-social behaviour in the park. The complaint was resolved after the owner of the caravan park agreed to change the policy so that a security bond would apply to all sites. A statement of regret was also provided to the two young people. 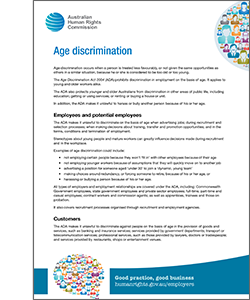 Employers have a legal responsibility to take all reasonable steps to prevent age discrimination. It is against the law to victimise a person for making, or proposing to make, a complaint to the Australian Human Rights Commission about age discrimination. Employers can also be held legally responsible for discrimination or harassment by their employees. For more information, see the fact sheet Vicarious liability.